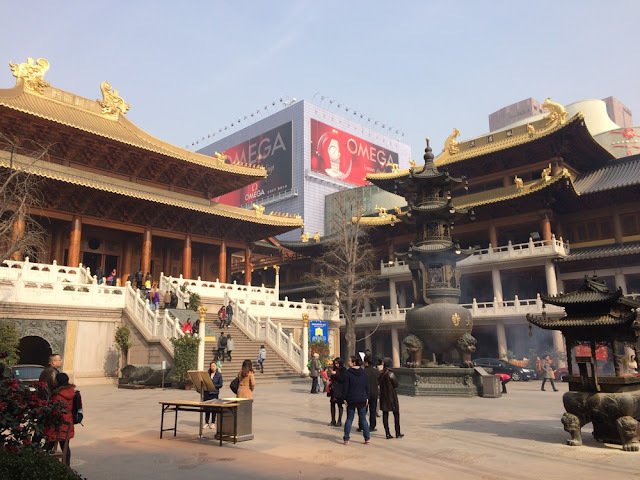 China: Jing'an Temple - a Buddhist haven amongst Shanghai's shopping malls. 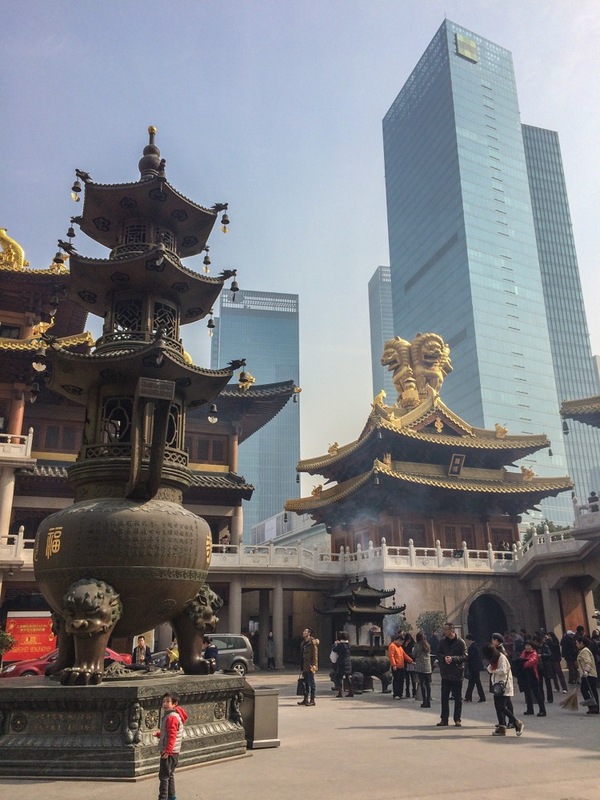 A very traditional Chinese temple, surrounded by gleaming towers and glittering brands. Shanghai doesn't have much in the way of traditional Chinese culture. There's the old town, which over the years has gotten a Disney-like feel, with 'Ye Olde Qing' style shops and teahouses. Tourists, many of them provincial Chinese on a package trip to the big, flock here in droves. Jing'an temple is a little different. It's set in an unexpected quarter of the city, around the corner from Gucci and Hugo Boss shops, and surrounded by shiny office towers. But it has seen a renaissance of sorts, attracting lots of worshippers, and maintaining a small community of monks. If you're looking for some traditional spirituality, this is probably as good as it's going to get in Shanghai. In the center of the modern city, on West Nanjing Rd, conveniently equipped with its own metro station. Map. MOST PEOPLE WOULD not venture into this part of Shanghai looking for spirituality, unless you find inner peace whilst shopping for Western luxury brands. There are several mega-malls, a swanky Swissotel, and lots of Gucci and Prada to blow your money on. At night, it's pretty dead: not even the desultory offers of dodgy massages that plague (male) tourists who wander near the Bund or Nanjing Lu. 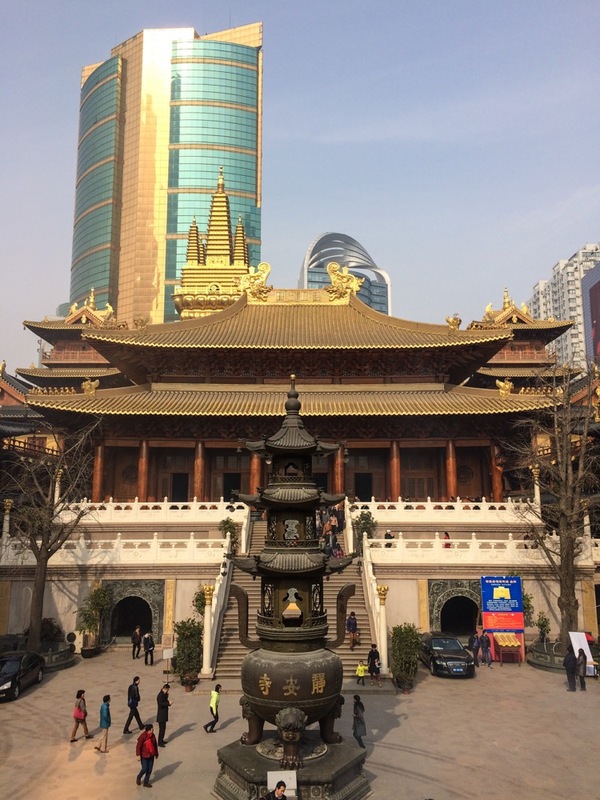 Like religious structures all over China, the temple suffered badly after the communist take-over and in particular during the Cultural Revolution, when it was turned into a factory. It was only in 1983 that it became a functioning temple again. Clearly lots of money was spent on its renovation, and the complex was equipped with a shiny tower that was completed in 2010, competing with the glass and steel skyscrapers that surround it. Coins on the Buddha's feet. The nice thing though is that it's really a temple, not just a pretty building for tourists. 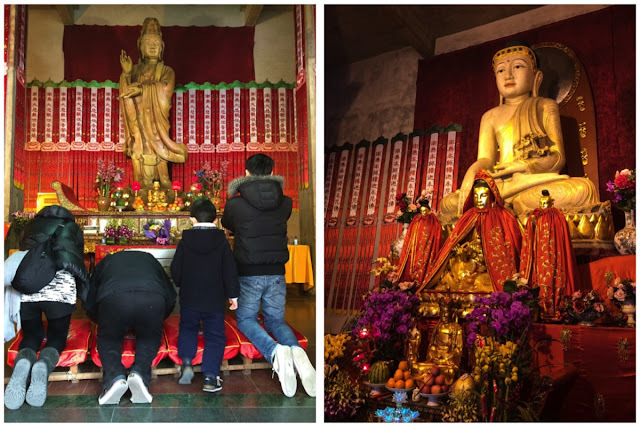 It's an active place of worship, and you'll see plenty of people coming in to burn joss sticks, throw coins into pots, and pray- perhaps for some cash to be able to afford the Gucci bag in the shop next door? 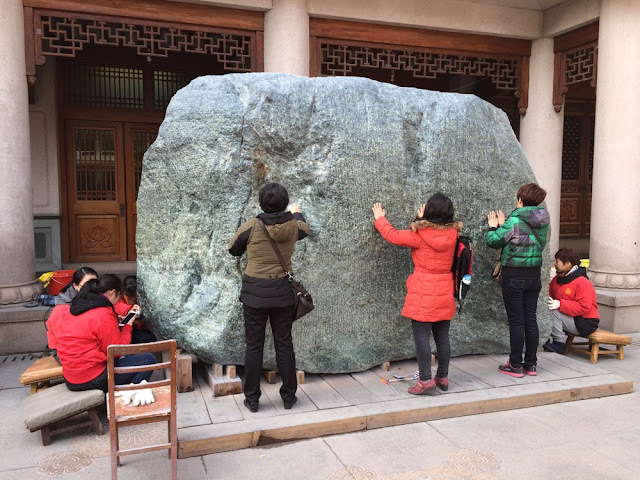 Apart from massive statues of the Buddha and Guan Yin, there is a block of jade the size of a mini-van, which is supposed to bring good luck when rubbed. Give it a shot- you've got nothing to lose. Yup, that's a big chunk of jade! 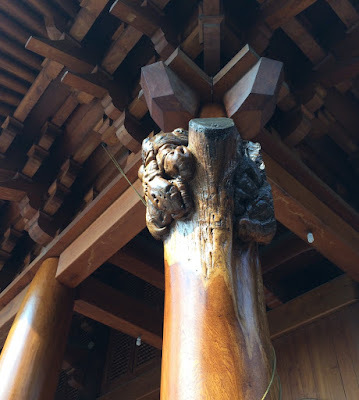 Then there's the massive wooden pillar that still shows the massive knots and warts of the branches it used to have. 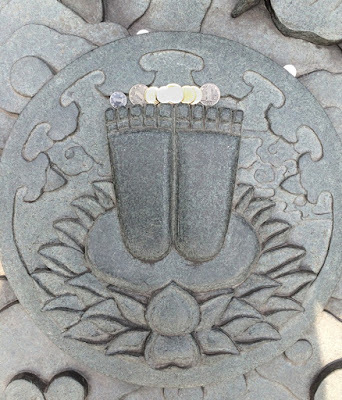 Worshippers place coins in the shallow carvings, hoping they'll stick- or they turn coin-tossing into an Olympic sport by aiming for a 3-storey high bronze vessel. What's for lunch today, brother? 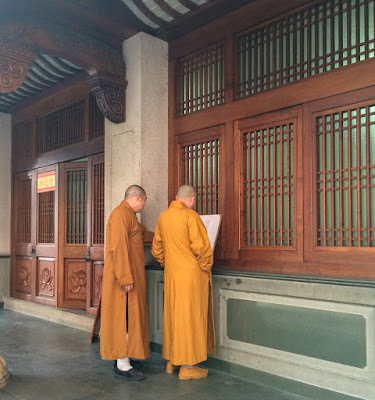 All in all this lively temple demonstrates that having shed the dogmatic certainties and morals of communism, people are increasingly turn towards traditional sources of moral and spiritual guidance. Which says as much about China as the shiny malls next door. Given that the temple sits on top of a metro station, this is pretty easy. Lines 2 and 7 stop here. 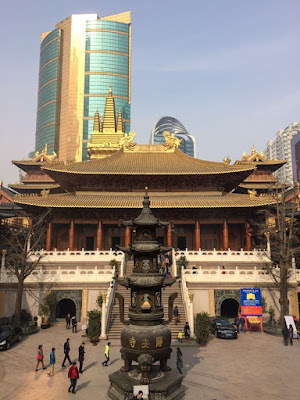 The Temple's website is only in Chinese (which is nice, as it supports the notion that the temple is squarely aimed at local worshippers, not foreign tourists. It does render it less useful though, unless you read Chinese. A taxi should set you back about 20 kuai coming from the Bund area. Here's the address in Chinese.